Summary: During the seventh annual Atrial Fibrillation Awareness Month, StopAfib.org is raising awareness about the risks of afib, including strokes, heart failure, dementia, even death. DALLAS, September 25, 2013 – September 2013 is the seventh annual Atrial Fibrillation Awareness Month. As one of the world’s leading atrial fibrillation (AF or afib) awareness-raising organizations, StopAfib.org has shared a wealth of information about this potentially life-threatening disease. Afib, the most common irregular heartbeat, can lead to dementia, heart failure, stroke, or even death. Many do not realize that they have it, and many who have it don’t realize how serious it is. Of those who have afib, one in three will have a stroke within their lifetime. Raising awareness about afib is intensely personal for StopAfib.org founder, Mellanie True Hills, and led her to create the first Atrial Fibrillation Awareness Month. Working with other organizations, Hills helped urge the U.S. Senate to officially designate September as National Atrial Fibrillation Awareness Month. In recognition of Hills’ ongoing worldwide advocacy work, the Global Atrial Fibrillation Alliance recently awarded her the GAFA Patient Ambassador of the Year Award. Hills received this award on September 14, recognized as World Atrial Fibrillation Awareness Day. For those who suffer from afib, StopAfib.org will conduct the Get in Rhythm, Stay in Rhythm Atrial Fibrillation Patient Conference on November 2 at the Westin Dallas Park Central Hotel. Leading medical experts will help patients and their families to better understand their condition and treatments and to proactively engage with their healthcare team. For more information, go to http://www.GetInRhythm.com. With extensive coverage in Spanish language media this month, StopAfib.org has helped promote awareness of afib throughout the Hispanic community. Hispanics are more prone to diabetes, and having both diabetes and afib greatly increases stroke risk. Mexican Americans with afib who have had a stroke are more than twice as likely to have another stroke as comparable non-Hispanic whites. Coverage of the StopAfib.org campaign has included stories in La Prensa, El Economista America, Noticieros Televisa, Orlando Sentinel, and Fox News Latino. What You Don’t Know About Afib Could Kill You Video: This quick overview video provides important facts that those concerned about afib need to know. Then, go to www.StopAfib.org and sign your name to the Sign Against Stroke in Atrial Fibrillation campaign in the lower right of the page. You’ll join over half a million people who have already signed the charter and are spreading awareness about afib and strokes. Get Started Learning about Afib Guide: For those suffering from afib, or their loved ones, this is an excellent place to start finding out how to live afib free. News and Videos: This section of StopAfib.org features the latest news and videos, including interviews with the world’s top afib doctors who can help patients understand the condition and treatment options. Patient and Caregiver Resources: Through these links, afib patients and their families can find more help with afib. Discussion Forum: Here, afib patients gather to support each other in living with afib. As the most common irregular heartbeat, atrial fibrillation, also known as afib, affects more than 5 million Americans. One-third of those who have the condition may not have symptoms. By 2030, as many as 17 million people may have it. About 350,000 hospitalizations a year in the U.S. are attributed to afib. In addition, people over the age of 40 have a one in four chance of developing afib in their lifetime. Having afib increases your stroke risk by 500 percent and can lead to heart failure and dementia. The mission of StopAfib.org is to improve the quality of life for patients and their families, support the doctor-patient relationship, and wipe out afib-related strokes worldwide. 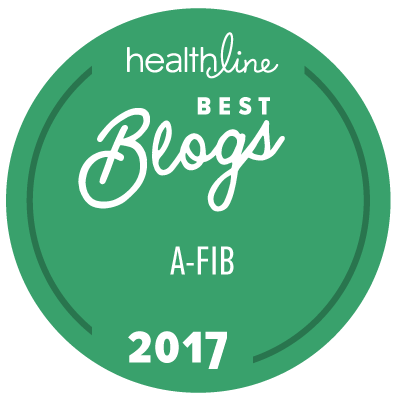 It provides information about atrial fibrillation symptoms, causes, risks, treatments, resources, and the latest afib news and videos. Now the No. 1 Arrhythmia site on the Internet and in the Top 5 Heart Disease sites, StopAfib.org has received the HON Code Certification from the Health on the Net Foundation, signifying a credible, trustworthy medical web site.